The Persecution of Diocletian was very difficult in some regions, among which was also Scytia Minor. In spite of the fact that it was a small province in a margin of the empire, the zealous leaders of the Roman legions stationed here made that the imperial decrees agains the Christians were applied very strictly. 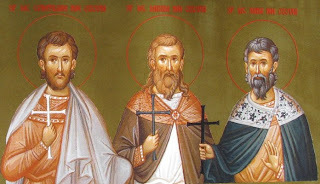 About the end of April there are celebrated many martyrs in small towns of Scythia, such as Axiopolis (today, Cernavodă) and in the capital of Moesia Inferior, Durostorum (today, Silistra). 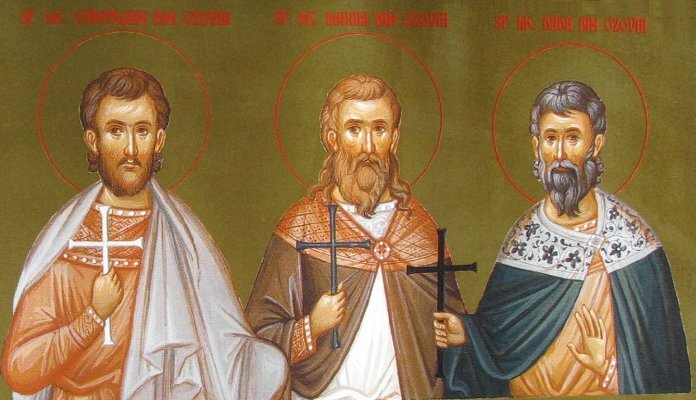 Because of their number, the Durostorum martyrs Pasicratus and Valentine, Nicander and Marcian, Iulius the Veteran and Hesychius (died in the same year, 298, between 26 April and 8 July) together with Emilian (18 July 362), will have their own article on 28 May. Here we will refere to another three non-soldier martyrs killed in Ozovia or Ozobia, a small village near Durostorum, on a date of 28 April. They were Maximus and Quintilian, supposedly Romans, and Dadas, probably a local (Dacian). Maximus was lecturer, that is an inferior clerical distinction given to one who used to read passages from the Bible during the divine services. 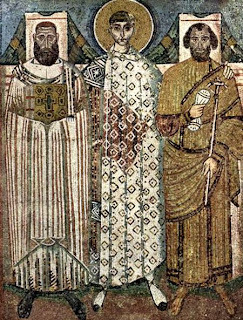 The three Christians were arrested after the proclamation of Diocletian’s edict of persecution. According to this edict it was commanded that all the people to bring sacrifices to the ancient gods, so that the secret Christians to be revealed. Some people let to know the governors of Moesia Inferion, Tarquinius and Gavinius about the fact that there were three Christians. Consequently the Christians were arrested and brought to Durostorum. Their process followed the classical path. The governors asked them to legitimate, so that Maximus answered that he is Christian, and after the human habit he is called Maximus. It was a custom among the Christians to tell firstly their identity and only after, their names. Tarquinius asked them to bring sacrifice to the gods, but Maximus responded aggresively that the emperor was a sinner and not a god, and that there is a single God and that is Jesus Christ, the emperor of the Heaven who cares for all. The other two refused also to sacrifice, so they were sent to the prison, where an angel revealed to them their martyrical death and encouraged them. The second day they were beaten, but they have kept their faith. At the noon they were sent back to prison, and later, brought to their home village, in Ozovia, where they were beheaded. It was 28 April, probably 304. An inscription discovered in 1947 by the archaeologist Ion Barnea in the Romanian town Cernavodă brought back in the attention of the historians and theologians about three of the many martyrs in Scytia Minor during the Roman Persecution. The text of the inscription, today in the National Museum of History from Bucharest, written in Greek, was: „Kyrillō Kyndaia Taseiō aratheitomai eufrasin”, which means „to Kyrillos, Kyndaias and Taseios I bring praise”. This text was interpreted by different researches, who tried to solve a much complicated hagiologic case as it shows to be at the first sight. 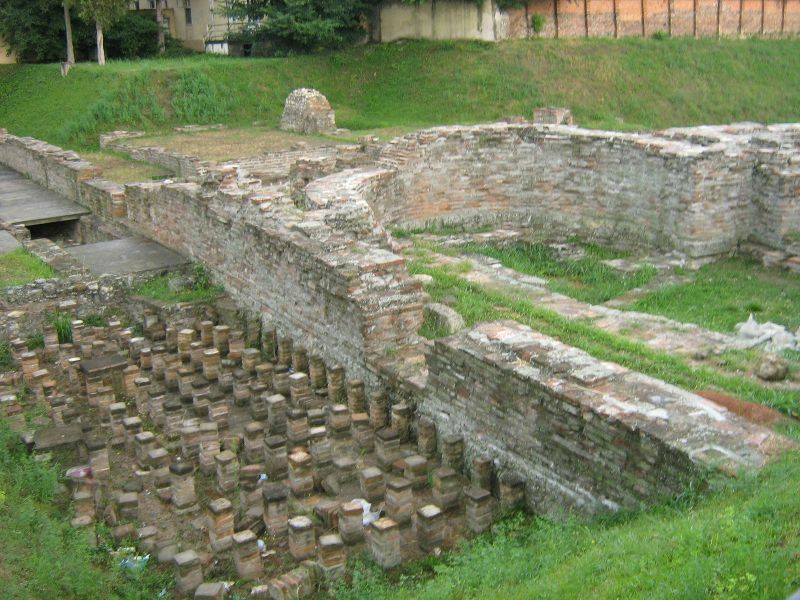 The name of the old Greek and later Roman city situated on the actual site of Cernavodă was Axiopolis, port on Danube, probably founded by the people from the province’s metropolis, Tomis (today Constanţa). Its importance consisted later also in the fact that it was the seat of the Roman legion II Herculea. It seems that the Christian life was very early here as in Tomis, because many old martyrologies (Syrian, hieronymian, Greek) note the martyrs in Axiopolis during Diocletian’s persecution, from 303. We will speak about the three martyrs in the following. 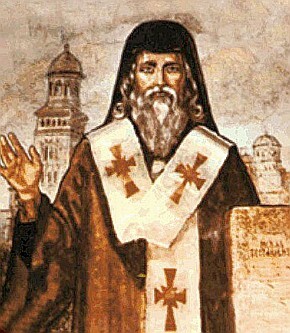 Saint Kyrillos or Cyril was very popular in Axiopolis, because he was celebrated alone at 12 May (syriac breviarium) and together with Chindeus (Kyndeas) on 9 march (again the syriac breviarium) and 26 April (hieronymian martyrology, in codex Epternaciensis from Paris), but also on 9 May (hieronymian Martyrology, in a codex from Berna, together with Quindeas and Zenon) on 10 may (the same codex, together with Quindeas, Zenon, Dio(n), Accacius and Crispus). Its celebration for 5 times in the year it may be a sign he was a local from here – maybe he died on 26 April, because the hieronymian Martyrology speaks in that day about his birth for the eternal life. The historian Procopius from Caesarea (6th century) writes about the renowned fortress of Justinian near Axiopolis that it bore the patronage of St. Cyril. It is also possible that the here discovered ruins of a big cemetery church may be the original place of his tomb. The inscription about the three saints was also discovered together with these ruins. In a variant of the hieronymian Martyrology from Monte Cassino St. Cyril (9 may) is named as bishop, which is very hard to believe, because only in Justinian’s era there were more bishoprics in the region, others than Tomis. 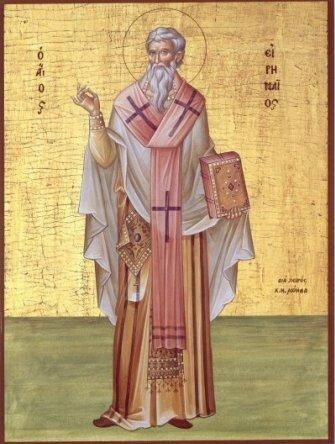 In this case, Cyril may be the bishop of Gortina (Crete) who died during the same persecution, but celebrated in another days (14 June and 9 July) or may be an auxilliar bishop (chorepiskopos). Saint Chindeus (or Kyndeas, Quindeas) is associated with Cyril on 9 March, 26 April (as Vindeas), 9 and 10 May as seen before. The Syriac Breviarium celebrates him separately on 20 January. Today a saint with this name is celebrated in the Orthodox Menologies on 1 August, as originally from Perga (Pamphilia). He might be of Roman ancestry, after his name derived probably from Quintus. Victricius of Rouen (early 5th century) mentions him in his De laude Sanctorum among the thaumaturg (wonderworking) saints from Thracia and Moesia. Saint Dasius (or Tasios, Taxius) mentioned together with the martyrs in Axiopolis is quite a problem. Normally he is considered to be the martyr from Durostorum (today Silistra in Bulgaria, about 60 km to south), celebrated on 20 November. But the martyrologies associates him with Axiopolis, on 4 October (the martyrical act of Taxius and Hermes from Axiopolis) and 5 August (hieronymian martyrology: „in Axiopoli Hirenei, Eraclii, Dasii”).The name of the city and the inscription might be a sign that he would have died here, maybe together with Cyril and Chindeus. The Martyrology of Dasius from Durostorum may be resumed as following: He died in 20 November 304, during the persecutions of Diocletian. That happened in connection with the roman feast of Saturnalia, very popular among the soldier. On this occasion a soldier used to be chosen by draw to be the symbolical representative of Saturnus. He was dressed in imperial clothes and during 30 days it was permitted to him to commit the most monstrous acts, including especially acts of sexual misbehavior. At the end of this celebration, the soldier was ritually sacrificed to Saturnus, usually by cutting him with the sword. In 304 the draw has fallen on the Christan soldier Dasius, who „kindled by zeal” and knowing about the shortness of the time, he decided that it is better to suffer tortures for a while in the name of Jesus Christ and to inherit the eternal life with the saints, than to accept the 30 days of joy. So he confessed his faith and that he prefers to be a sacrifice for Christ. He was imprisoned and in the second day his general Bassus proceeded to the judgement. Dasius confessed that as Christian he obeys only to the celestial Emperor, living during His grace and being enriched by His divine love. After some attempts and tortures for convincing him to abjure the faitn, Bassus ordered the beheading of Dasius. It may be that only before that, his relics to be transported in Durostorum. Later, in 579, his coffin was transported to Ancona, in Italy, being kept until today in St. Cyriacus Church. It is written on it in Greek „here lays St. Martyr Dasius brought from Dorostolon”. 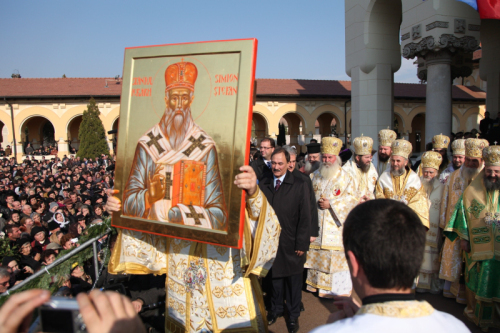 Parts of his relics were brought by the Pope John Paul II as a gift for the new re-created metropolitan diocese of Durostorum (Bulgarian Orthodox Church), 22-23 October 2003. 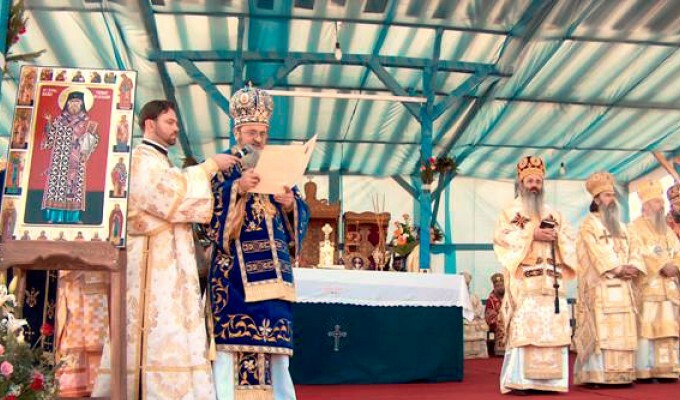 Saints Cyril, Chindeas and Dasius are today jointly celebrated in the Romanian Orthodox Church on 26 May. There is a project to build a monastery in the place where the inscription about them was discovered. 5 August: St. Irenaeus and Heraclius (together with Dasius, in tne hieronymian martyrology). 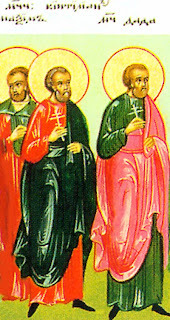 The four hierarchs of Transylvania celebrated on 24 April, Ilie Iorest, Simion Ştefan, Sava Brancovici and Joseph of Maramureş were bishops over an oppressed population. The Orthodox faith and the Romanians in Transylvania had no rights in the country dominated since the middle Ages by the Hungarian noblemen, who shared the rights with the Germanic minorities. The so-called Transylvanian tolerance during the middle Ages is only half true. If the political rights of the Hungarians, Szekelys and Saxons were well respected, the Romanians had no political rights and no possibility to send representatives in the local parliament and no specific diocesan seat. Moreover, their religion was only mutually tolerated, but had no rights like the other 4 official religions (“religiae receptae”). In these conditions, the princes and the noblemen tried to convert forcibly, or by promising some rights, the Romanian population. The bishops celebrated on April 24 tried to preserve the minimal tolerance, asking for political sustaining in Moldova, Wallachia or Russia, and sometimes using compromise solutions. Saint Ilie Iorest resided as Metropolitan of Transylvania in Alba Iulia, the capital of the country at that time. There are not so many documents who attest him, but they are enough to create a portrayal of his. 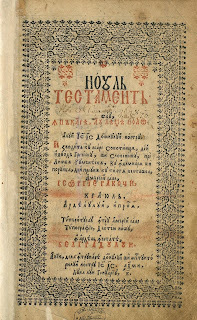 A letter of the Moldavian bishops addressed in 2 June 1645 to the Tsar Mikail Feodorovich of Russia attests that “this hierarch named Iorest is born in the Hungarian Country (=Translylvania), but he was instructed from his childhood in our country, Moldova, in Putna monastery, and he was tonsured as monk in the same monastery, and after a while he was ordained as priest”. His ordination may have been made by Metropolitan Anastasie Crimca of Suceava (~1607-1629), or by the retired bishop Efrem of Rădăuţi, who lived at Moldoviţa, just over the hill from Putna, or by the next bishop of Rădăuţi. The last page of a Slavonic Psalter Book from Putna comprises his not so often name, “hieromonk Iorest, vlet (=in the year) 7133 (=1625), November 8”. This notice made the historians to suppose he was born around 1600. 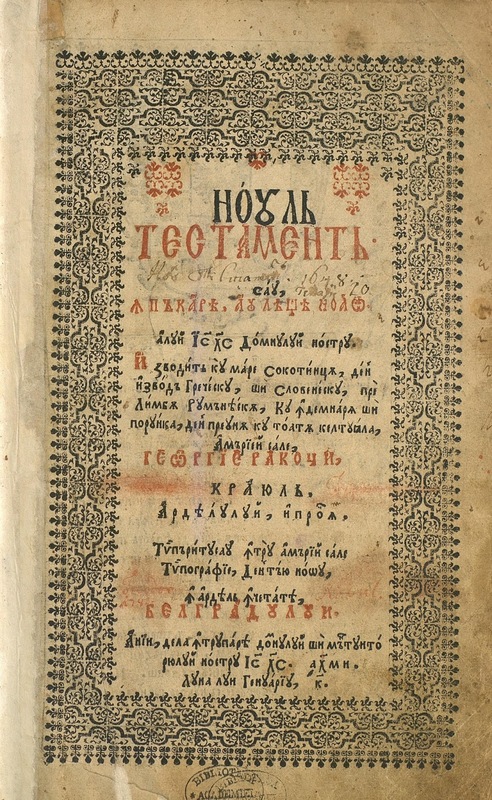 A decade later, in 1637 the priest Manoil from Suceava was finishing a Slavonic copy of the Byzantine Synaxarion of Simeon Metaphrastes (10th century) begun in the copyists school of Anastasie Crimca and continued by „hieromonk Iorest, hegumen”. This manuscript, kept today in St. Petersburg attests that Iorest was Abbot of Putna, one of the biggest monasteries in Moldova, in 1637. At 3 September 1640 Gennadius III, metropolitan of Transylvania, died and just the second day, the superintendent of the Calvinistic confession, Stephan Katona Geleji recommended to prince George Rakoczy I some conditions for electing a successor. Among the three candidates was a Wallachian, the Abbot of Govora Monastery in Wallachia, a local, the dean of the priests in Haţeg, and Iorest, recommended by Vasile Lupu, voivod of Moldova. Rakoczy accepted the latter in October 1640 and was ordained as traditionally in the Cathedral from Târgovişte, the capital of Wallachia, being a sufragan of the Wallachian metropolitanate. Going in Transylvania, he reprinted the “Gospel with teaching” from 1581 and made a lot of canonical visits, but in February 1643 he was cast away from his position, because he didn’t accept the calvinization and the spread of a Calvinistic Catechism printed in 1642 and also because of the worsened relations between Rakoczy and Vasile Lupu . The letter of the Moldavian bishops to the Russian tsar attest that he was twice imprisoned together with some other priests because he refused to convert to Calvinism. According to the medieval Document Approbatae Constitutiones, the religious oppression was forbidden, but the bishop was instead accused of immoral acts. He was unjustly judged (10 October 1643) and after his releasing by having 24 warrants who promised to pay a tax of 1000 talers, in November 1643 he fled in Moldova. In June 1645 Iorest left to Russia in order to collect money and other helping for the Transylvanian clergy and for his warrants, together with German, a monk from Putna and his nephew, Jurca. At 25 August was in Moscow and obtained an audience to the tsar and a financial help, but no more. He remained for some months there and later came back in Moldova, where he remained as simple monk at Putna, until 1656 when he was for a while bishop in Huşi, but shorter afer (1657) he came back to his monastery by unknown reasons and remained here until his death. 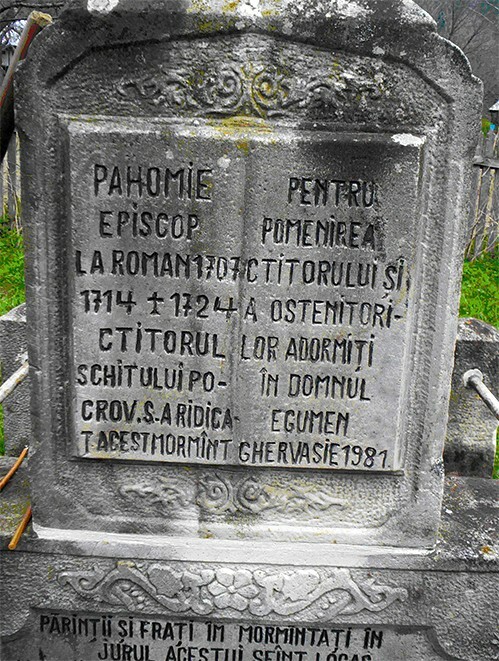 A menologion of January attests that “Bishop Iorist died in 7186 (= 1678), March 12” being buried outside the big church of Putna, on the eastern side. The successor of Iorest in Alba Iulia eas Simion Ştefan, a former student at the school from the Orthodox Monastery in Alba Iulia and later hieromonk in the same convent. He signs with the title “Archbishop and Metropolitan of the throne of Bălgrad (Alba Iulia), Vad, Maramureş and the whole Transylvania”. The calvinization continued even stronger during his pastorship. Even from the election, it was granted to him the jurisdiction of only 3 deaneries of the all 20. It may be strange, but the canonical and pastoral jurisdiction for the rest of Romanians was granted to the Calvinist superintendent Geleji Katona Istvan. Even from his enthronement he was forced to sign 15 obligations, supposed to be given before to Iorest. Among them, he was forced to preach exclusively in Romanian (because the tradition was to preach in Slavonic). Through this apparently positive obligation the calvinization might have been implemented easier. Also the theological instruction should be made according to the Calvinistic catechism; the Holy Sacraments were reduced to bread and wine as the symbol of the Body and Blood Christi, and the cult for icons and for the Cross should have been banished. Anyway the difference among theory and practice was big, so even he signed the conditions, he didn’t implement them. During the pastorship of Simion Ştefan there were printed for the first time in Romanian the New Testament (1648) and the Psalms (1651), the most used biblical books. The preface of the text is signed by the Metropolitan, being dedicated to Prince Rakoczy. In this text he praised the prince because of the amount of money given for the education of some students but also warned him that he should care for the people under his jurisdiction should have spiritual food and drink. Moreover, he wrote that God didn’t make the people for the kings, but the kings for the people, in order to judge and protect them. Supposedly he is also the author of the “Word for the readers” included in the two books. On the margins on the pages it was printed a “Lexicon” explaining the rare words, regionalisms and neologisms. These Works were very important because it started the process of the unification of the Romanian language, which was not standardized before. The Metropolitan defined the circulation of the words like this: “We know very well that the words should be like the money, because that money is good who circulate in all the countries. The same thing is with the words, these are good, which are understood by all”. He knew the limitations of his work so that he brought in attention the difficulties of translation and using the best words, in order to be understood by all. That is why he reproduced in this preface a formula of humility presented already in another Orthodox books as Pravila (The Law) of Govora (1640): “Consider, ye reader in this book, because it was not written by the angels from heaven, but from a sinful hand, made from dust”. About 200 years later, Andrei Şaguna, another metropolitan of Transylvania attested the importance of the first translation of the Bible, which influenced the whole future language. The translations of the biblical books were not addressed only to the Orthodox in Transylvania but also to the others, so he contributed to the both spiritual and cultural edification of the Romanians. Simion Ştefan might have died in 1656 when his successor is attested. His burial place is unknown. The life of Sava Brancovici is well known, being described in a Serbian chronicle written by his brother, George. He was from Serbian ancestry from Korenic, in Hertzegovina. At the end of the 16th century his family fled in Arad because of the Ottoman expansion. Sava was born and baptized as Simeon in 1620 learning in Hungary, Serbia and Bulgaria. Later he went to Comana Monastery, southern from Bucharest, where his uncle Longin was Abbot and bishop. Later he came back home due his father’s death and later married and had children, but all died young. Simeon was ordained priest by Metropolitan Ştefan of Wallachia and on the way back home he heard about the death of his wife. He remained as priest and dean in Ineu (near Arad) for some years, being in the same time the leader of the Romanians in front of the Turkish expansion. In the summer of 1656 Simion Ştefan died and the Orthodox council in Alba Iulia elected him as Metropolitan. Consequently he was tonsured as monk in Wallachia, receiving the name of Sava at the Feast of the Holy Cross (September 14). On September 16 he was ordained bishop and went back to Transylvania. He had had the same problems as his predecessors and even more. Transylvania was at the time ruled by two parties, a pro-Ottoman and a pro-Austrian one. The changes at the throne happened during 1657-1662 made possible the official recognition of Sava only by the pro-Ottoman prince Michael Apaffy, at 23 April 1662. As Ilie Iorest, Sava started in 1668 a long journey to Moscow, in order to find political and financial help for the Romanians in Transylvania. In audience to the tsar Aleksey Mikhailovitch Romanov he presented a memory about the harsh conditions of the Romanians, Serbs and Bulgarians under the Turkish rules. After the second audience, on 2 August 1668 he became a financial help and the promise that the Tsar will help his diocese in the next seven years. At Christmas he was back in Alba-Iulia. The Russian journey made him problems and the pro-ottoman prince found out that Sava asked for political help too. So he imposed to the hierarch some restrictions. The metropolitan was from February 1669 on subordinated to the Calvinistic bishop and could not ordinate priests, judge, make canonical visits and call the Synod without the acceptance of the superintendent Peter Kovasznai. In 1670 Sava went to Wallachia and obtained from the voivod Antonie of Popeşti an annual allocation of 6000 of Aspers (late byzantine silver coins named in the Ottoman period as akçe). 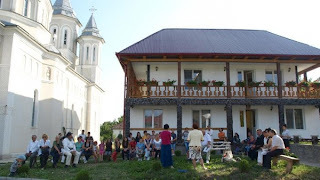 Back in Transylvania, Sava was present at the consecration of Moisei monastery in north and of the church in Vlădeni, in south. In 1675 Sava called a synod at Alba Iulia and decided the Romanization of the liturgical service, held until then in Old Slavonic. Also they decided the holding of the ceremonies also outer from the churches, in case of necessity. Other decisions were: dispositions for the priests for the catechization of the children, disciplinary norms, especially against the superstitions in the cult of the dead, quite spread among the Romanians. Finally, there were also norms about the learning of the basic prayers, about the Holy Communion at least during the 4 Lents during the year. These measures conducted to a special relation with prince Apaffy who granted some administrative facilities. In any case, the favorable situation ended in 1680 when the new Calvinist superintendent, Michael Mihail Tóföi discovered a complot against the prince, among whom was involved Gheorghe Brancovici, the brother of the metropolitan. 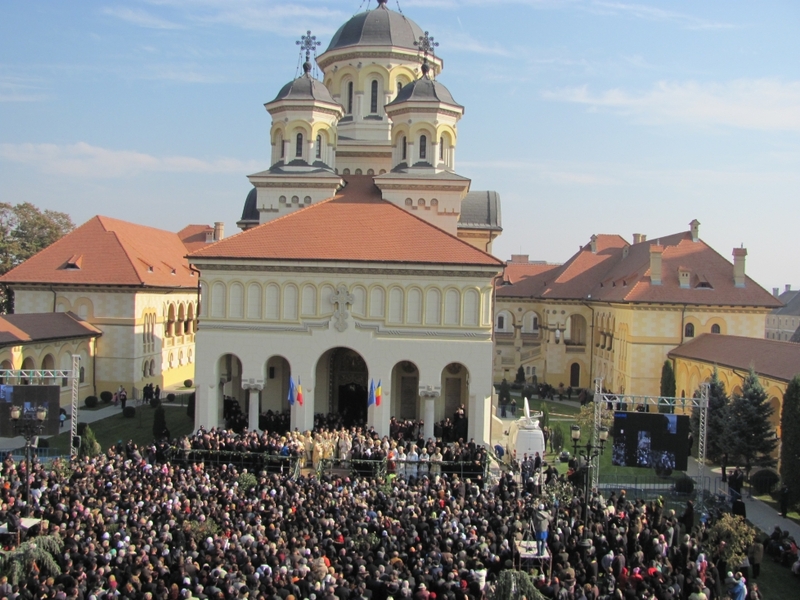 The prince called a judgment council in Sibiu, composed of 101 priests and laymen who accused the metropolitan of immorality and neglecting the monastery and the typography in Alba Iulia. It was partly so; it is said he might have hidden the typography, because in it there were printed Calvinistic books, so he wanted to prevent the spreading the books of other confession among the Orthodox. He was dismissed according to the 81th and 82nd canon of the Calvinist Church and 75th canon of the Romanian law and his properties, including books and the typography were confiscated. The Metropolitan and his brother were imprisoned in the prince’s castle from Blaj. Later his brother was sent in Wallachia in order to redeem both of them for 3000 talers. Sava was beaten regularly in the yard of the castle on Fridays (Chronicler Cserei Mihaly) and once he was so strong beaten with whips until the flesh was torn from him (according to the German chronicler Andreas Gunesch). Gheorghe asked for help from Şerban Cantacuzino, the prince of Wallachia and Apaffy consented for the freedom of the metropolitan. At the beginning of 1683 Emperor Leopold I of Austria granted him the title of baron, but he died shortly after his release, because of the harsh conditions in prison, in April of the same year. His burial place is also unknown. 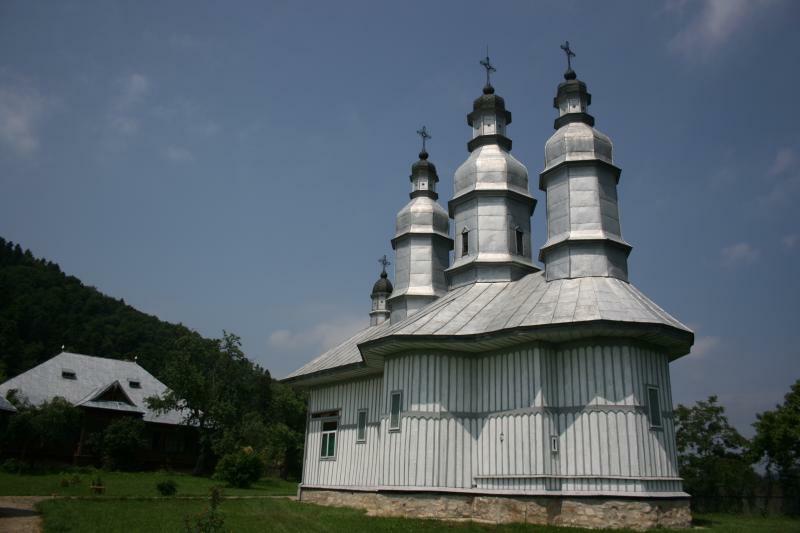 Northern Transylvania, also known as Maramureş (or Marmaroshchina in Ruthenian) had its own bishops in Munkach (Mukacevo in Ukraine). In 1646 a part of the priests and believers accepted the conditions of the Union of Brest (1656) and became Greek-catholic. 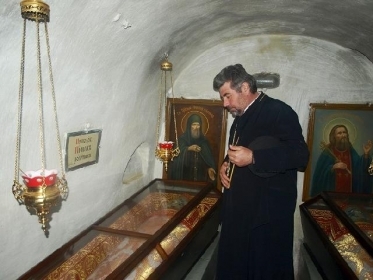 But a part of them wanted to preserve their confession, and elected a new bishop for the remained Orthodox believers, in the person of the widower priest Iosif Stoica, nobleman from Criciova (today in Ukraine). He was tonsured as monk and later ordained as bishop by Dosoftei, the exiled metropolitan of Moldova, in Jolkiew, Poland. The residence of Bishop Joseph is unknown. He signed in 1692 on an Antimension with the name “Joseph, from God’s mercy orthodox bishop of Maramureş, stauropegial Constantinople exarch and locum tenens of the Metropolinate of Transylvania from Bălgrad (Alba Iulia)”. The Hungarian historian Nicolae Bethlen, former chancellor of Transylvania during that period, has noted that Iosif Stoica wrote a letter opposing union with the Roman Church, based on arguments from the Scriptures and the writings of the Church fathers. Bethlen noted his surprise that a rural Romanian was able to produce "a letter of such theological strength". His relatively peaceful pastorship was struggled in 1701 when he was called in Viena and it was proposed to him to renounce to the Orthodoxy in change of some material advantages, but he refused. In 1705 the vice-count of Maramureş, Franciscus Darvay obliged Joseph to sign a programme in 20 paragraphs which were against the Orthodox faith. He refused and so was arrested and imprisoned in Chust. His priests protested, but without any result. During this detention, in 1707 they have elected a new bishop in the person of Iov (Job) Ţârca who was also persecuted, but fled in Moldova so he was convicted to death in the absence. After being released in 1711, Joseph Stoica continued to exercise his episcopal functions without the knowledge of the authorities. He tried to recover his bishopric officially, but died in the same year. 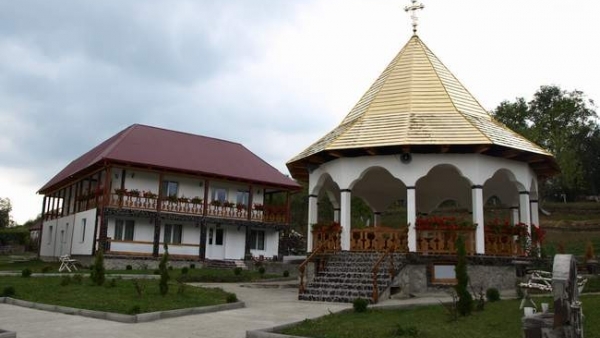 He is supposed to be buried in the old church situated on the Crosses’ Hill in the village Mânăstirea (=the monastery), Giuleşti commune near Baia Mare, the today capital of the county. Joseph remained in the memory of the Orthodox believers in Maramureş as a protector of their faith against the rulers. 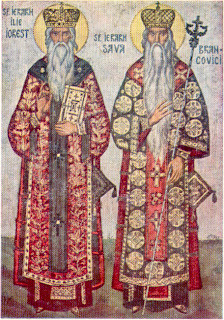 Ilie Iorest and Sava Brancovici were proposed for canonization in 1950 by Nicolae Bălan, metropolitan of Transylvania at that time. His proposition was made in account of the pure life and for their devotement in preserving the faith against the oppressive system. The Romanian Synod approved the canonization of them in 25 February 1950 and decided the two to be jointly celebrated on April 24, the date of death of St. Ilie Iorest, as confessor saints. The solemn canonization was held in the Orthodox cathedral in Alba Iulia, in 21 October 1955 and subsequently their service was introduced into the liturgical books. The other two canonizations are recent: about of the St. Joseph it was decided by the Romanian Synod on 20 June 1992, and the one of Simion Ştefan on 21 July 2011 for the same reasons, the purity of lives and the stability in fait. They are celebrated since then on 24 April too, jointly with the two other metropolitans. Saint Pahomie from Gledin, bishop of Roman (1707-1714) was a Romanian hierarch in the so-called „fanariot” period of the Romanian history (18th/19th centuries), named so after the princes mostly of Greek ancestry, and came from the Greek quarter of Constantinople known as Fanar. This period is known in Romania as a time of the maximum interference of the foreign interests in the internal policy, but also for the internal changes, as the first Romanian constitution and the revival of the orthodox spirituality, under personalities as staretz Vasile from Poiana Mărului and Paisie Velichcovski from Neamţ. 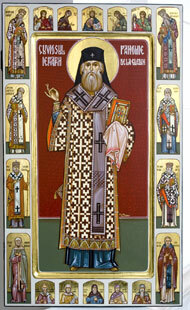 The life of the saint is comprised in a biography from Pocrov hermitage, entitled “Short exposition for the happy-into-the-memories [=i.e., deceased] Kir [=Lord] Pahomie, bishop of Roman, the founder of the holy shrine of the our All Holy Lady Theotokos and Virgin Mary, which he himself built from its foundation in honor of her Pocrov (=Protection)” (“Arătare în scurt pentru fericitul întru pomenire ctitorul sfântului locaş al Prea Sfintei Stăpânei noastre Născătoarei de Dumnezeu şi Pururea Fecioarei Mariei, kir Pahomie Episcopul Romanului, pe care însuşi din temelie l-au zidit întru cinstea Acoperămantului ei”). It was written by the monks from the hermitage, after the memories of Pahomie and of his disciples and after the traditions kept in Neamţ Monastery, where he lived for a while. Saint Pahomie was born in Transylvania, Bistriţa County, in a village named Gledin in 1674, baptized as Peter. His parents were, after a source, “priest Iftimie and Ana” Pencu, and after another (the historian Nicolae Iorga), “peasants, workers in this county of the Saxons”. The two informations aren’t opposite; because at this time the Orthodox faith was not one of the 4 “accepted religions” in Transylvania and the orthodox priests had had the same difficult life as the other Romanians, who were mostly enslaved. The biography from Pocrov mentions his love for Christ and his will to live after the Gospel, so that “he left his house, parents, brethren, relatives and others” and went in another land, at that time Transylvania and Moldova being two different countries. Among another reasons he left his country it cannot be the persecutions against the ones who refused after 1700 to unite with Rome, because he left Transylvania a few years later, in 1694. More likely the reasons consisted in the liberty of religion in Moldova and the “cultural boom” of the Moldavian monasteries and monastic schools. So Peter went to Neamţ monastery, where he was tonsured as monk in 1697, receiving the name Pahomie, being about 25 years old. But the cultural situation was in contrast with the political one: during the war between the ottoman Turks and the Holy League (1683-1699), the Poles occupied the Neamţ Fortress, never conquered before, and the monks from Neamţ found their refuge, together with their precious icon of the Protection of Our Lady, running to Strâmba hermitage, somewhere in the Tutova hills (central Moldova). The monks came back after the end of the war, in 1700 and in the next year Pahomie was ordained priest. Because of his good administrative skills, he was shortly appointed Great Ecclesiarch, so responsible for all that concerns the church, the liturgical ceremonies and so on. In any case, the biography attests not only his abilities, but also his attachment for the church, the love for prayer and good deeds. 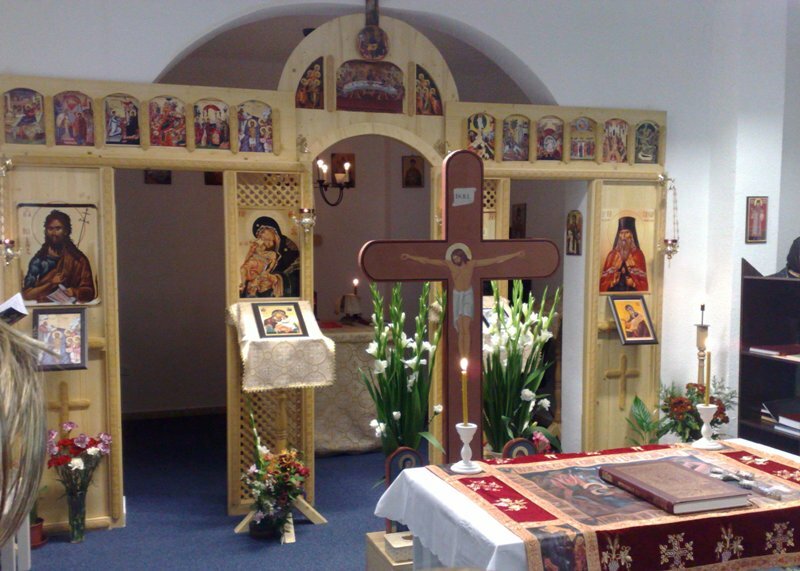 Because the liturgical services were in Church Slavonic, Pahomie learnt Slavonic and Russian. In 1702 the abbot Ioan died, and the council of the monastery elected him as the new abbot, against his will, before he was 30. But he remained in this function only for 2 years (1704) when he made a rise in Russia. It is quite possible he didn’t like very much his function as abbot, which meant a lot of responsibilities and not too much time for prayer. So he made a “paretisis” (he resigned) and left in Russia, to Rostov, where he wanted to meet and know St. Dimitrij of Rostov, well known at that time for his sermons and writings, but also to visit the Pecerska Lavra from Kiev and to honor the holy relics there. He remained at Pecerska between 1704 and 1708 where he has studied at the school of the monastery, organized after the western scholastic methods by the already deceased Metropolitan Petru Movilă (+1646). The contacts with the scholars from Kiev and especially with St. Dimitrij (Demetrius) of Rostov meant not only a good study, but also a spiritual experience. The most intense meeting with the Russian hierarch is described by Pahomie himself. St. Dimitrij asked him once: “what wishes your heart? And I told him that it wishes a life of silence in the solitude. And then he blessed me from all his heart and said to me: May that God be with you. Your wish is happening”. 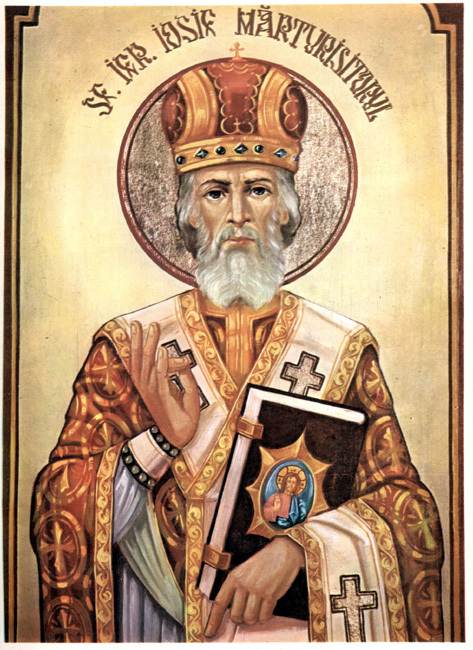 He also met another Russian saint, St. John Maximovich, archbishop of Chernigov and Tobolsk. Pahomie came back in Moldova with some books: A Psalm book from Kiev, a Patericon (Lives and sayings of the Monks in Egypt) from Bishop Dimitrij, and a prayer book for the hierarchs. 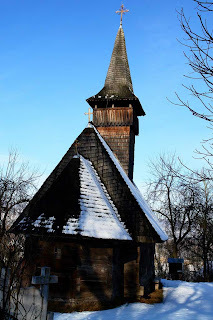 In 1706 he was in Neamţ, where he asked the council of the monastery to be left to live quietly in the solitude, and he found a cell together with a few disciples (Sofronie, Macarie, Lazăr and Ioanichie), in a mountain nearby, called „Chiriacul”, about an hour to walk from the monastery. His solitude was interrupted by some noblemen of the Voivod Antioh Cantemir (1705-1706) who incidentally found the cell of the monk, being on hunting. The impression produced by the holy monk on the noblemen was very strong. No later, the bishop Lavrentie (Laurence) of Roman died, and the noblemen remembered above proposed St. Pahomie to the voivod. Against his will, Pahomie was elected bishop on 18 December 1706 and in 18 January 1707 was ordained bishop. Acting as bishop for 7 years and 3 months, Pahomie refused to involve himself in the quite often changes of the reigns (actually 5 changes of voivods) and generally in the politics. In change, he cared about the poor, but also acted as a good administrator of the diocese’s holdings and as a judge, as the laws of the countries specified. He signed his documents in Slavonic as "Pahomie Penkovski arhiepiscop Romanski i Galatski" (Pahomie, archbishop of Roman and Galaţi) revealing his slavicized form of his family name Pencu, and the fact that his diocese comprised the whole southern half of the country. He won for the Church many properties, donated to his monastery some holdings, but above all, books for liturgical use, which were quite precious at the time. But at 1 March 1714 he wrote his paretisis (resign) from his function as bishop, under the reason that “the whole world is passing, and all the things like a shadow”, wishing to go back to his solitude at Chiriacul mountain. His resign happened in a period when the stability was bigger than before, so he didn’t act cowardly, but because of his inner deep wishes for a quiet life. He remained bishop one more month, until the Feast of the Easter (2 April in that year), but on 10 April arrived at Neamţ where he remained only 4 days and went back to Chiriacul. Away from the crowded places, Pahomie put the founding stone of a hermitage named „Pocrov” (The Protection of Our Lady, a Feast on 1 October). 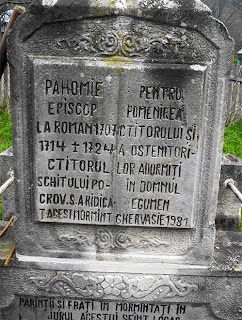 A „pomelnic” (list of names, used in the commemoration during a requiem ceremonial) from this period, attests the contributors at the building of this new shrine, among whom are some monks but also voivod Mihail Racoviţă. Normally a hermitage is a dependency of a monastery, but Pahomie obtained for his shrine the total independence, and also some other benefits (properties, books, and official documents attesting the independence of the hermitage). He also created here a school of manuscript-copyists and translators, who continued the tradition started at Neamţ by Paisie Velichcovski. 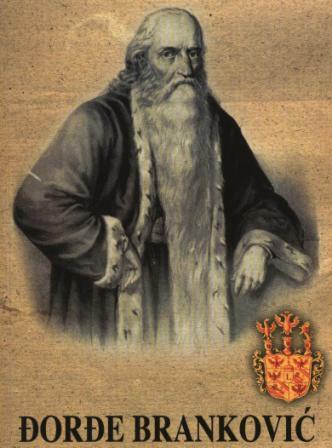 In 1717, during the Turkish-Austrian war (1716-1718) the voivod Mihail Racoviţă lost his throne, but he came back helped by the Tatars who made a lot of damages. In these conditions, Pahomie left his hermitage, running in Transylvania, later in Poland for some health problems and came back home a year later. But the voivod Mihail Racoviţă suspected him of conspiracy with his Austrian enemies, so that Pahomie was forced to flee to Kiev, waiting for returning, after the ending of the unfriendly reign, but that didn’t happened, because Racoviţă remained voivod until 1726. From his exil, Pahomie cared about his hermitage, sending 42 books and money in order to sustain the activities there. Pahomie remained as refugee at Kitaev hermitage of Lavra Pecherska and he received here the Great Skema, being named Pimen. He died in exil, on 14 April 1724. In his testament, written shortly before his death, he stated that the monks in his hermitage of Pocrov shall live a life of fasting, prayer and working, with devotion, humility and responsibility. The coffin with his relics is kept in the chapel of St. Sephen of Pecherska. 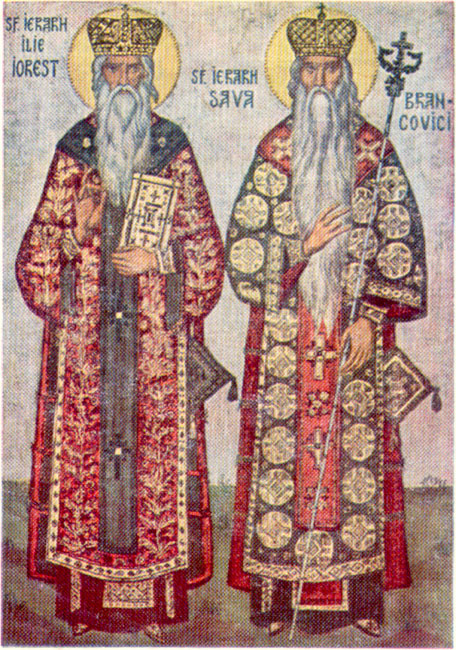 A painting with his portrait at Pocrov shows him with his three patron saints, St. Peter (as layman), St. Pachomius (as monk) and St. Poemen (as skemamonk). The Holy Synod of the Romanian Orthodox Church decided for the canonization of the St. Hierarch Pahomie from Gledin, during its reunion on 14-15 november 2006. His proclamation happened on 14 April 2007 in Gledin, the birthplace of the saint situated in northern Transylvania, in Bistriţa-Năsăud County, in the presence of bishops, priests and believers from Romania and Ukraine. His annual celebration is 14 April. In Gledin, the locals started in 2011 the construction of a religious-touristic complex dedicated to the saint. In Villaverde-Madrid, Spain, the patron saint of the Romanian community is St. Pahomie. Very luminous star arisen in Gledin, you shone like a divine sign in the country of Moldova, illuminating the hearts of the believers. Unshakable pillar of the clean prayer, you, chosen adornment of the Romanian hierarchs and founder of the Pocrov Hermitage near the Lavra of Neamţ, Holy Hierarch Pachomius, pray to Christ our God to save our souls! Saint Irenaeus (or Irenaios) of Sirmium, bishop of the most important roman city in the 3rd century on the Danube, is a martyr saint of the latest roman persecutions against the Christian in the Balkans. As already mentioned in the passio of Sts. Montanus and Maxima (+26 March 304), the situation of the Christians in the western Balkans (province of Illyricum) at the end of the 3rd century was quite difficult. The Roman Tetrarchy, composed by Diocletian, Galerius, Maximian Hercules and Constantius Chlorus gave four edicts against the Christians, three in 303 and one in 304. Because the new religion didn’t accept the imperial cult, its adepts were considered direct enemies of the state and therefore the ones discovered to be adepts of this dangerous faith were tortured to death, in order to come back to “order”. Of course, the most hunted were the members of the hierarchy as the leaders of the community. The imperial edicts stated, near the physical punishments, the destruction of the Christian places of worship, the confiscation of the Christian possessions. Of course, the edict had a different way of applicability in the roman provinces. Galerius, who governed the Illyricum from its capital, Sirmium (today Mitrovitsa, not far away from Belgrade) since 21 May 295, respected strictly the decisions of the edicts. There is quite possible to be influenced by his mother, Romula, who detested the Christians. In this context was tortured and killed St. Irenaeus, the bishop from Sirmium. There is unknown if he was the first bishop of this important city, or there were some other bishops before. The martyrical act of St. Irenaeus is kept into Latin in its original form, being probably a copy after the verbal process from the court leaded by the governor (praeses) of Pannonia, Probus, the same who convicted a few days before the priest Montanus and his wife, Maxima. Probably only the introduction and the conclusions of this text were added by a Christian author. The document is important because it attests the Christianity in the Danube provinces, but also by describing the roman judging procedure in the times of Diocletian and Galerius. The critical edition of this text was edited and published in Latin and English by Herbert Musurillo in The Acts of the Christian Martyrs, The Martyrdom of Saint Irenaeus Bishop of Sirmium, Oxford, 1972. The resume of this text it will be reproduced in the following: Saint Irenaeus, in spite of being bishop, was married and had young children. He was arrested by the order of Probus and judged in the court from Simium. Probus asked him to obey the law and to sacrifice for the gods, by Irenaeus responded that “the one who sacrifice to gods and not to God will be removed from the chosen ones” (Acta II,1). Refusing to bring sacrifice, he was prepared for tortured, saying that he is happy to be a part of the Lord’s sufferings. Probus still repeated his question, whether sacrificing or not, during the torture. Later, trying to convince him in another way, he brought the parents of the bishop and later his children who asked him to have mercy of them. The other relatives tried to convince him, telling “have mercy of your youth” . In any case he refused repeatedly so Probus sent him finally into jail for some days. Later, Probus ordered that Irenaeus to be brought in the middle of the night and started the torture again. After beating him with rods, the governor asked him if he has relatives, children, wife, parents, but he answered “no” and stated that any Christian loving his relatives more than God is not worthy of his Master (Mt. 10,37). Probus tried once more to convince him for the sake of his children, bur Irenaeus said that they have the same God who can save them. Finally Probus didn’t resist anymore so he menaced him by beheading him. Irenaeus thanked for that and asked the Roman governor to do it, in order to see how the Christians learned to despise the death for their faith in God. Shortly after, the soldiers have cut his head on the bridge of Basent in this city. In the last moments he prayed to the Lord with these words: “Lord Jesus Christ, who kindly wanted to suffer the passions for the salvation of the world, please open your heavens, in order that your angels receive the soul of your servant Irenaeus, who is dying in your name and for your people, who increases in your universal (catholic) church from Sirmium. I am begging you and praying your mercy, receive me to you and kindly strengthen the others into your faith”. 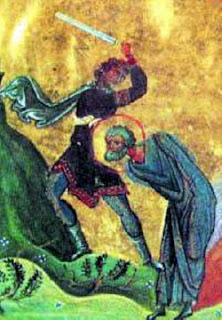 After beheading, he was thrown in Sava, the river flowing nearby. The author of the text ends the story by saying that he was martyrized in the 8th day of the Ides of April (6th April) during the governing of Emperor Diocletian and governor Probus, but also during the royal times of our Lord Jesus Christ. 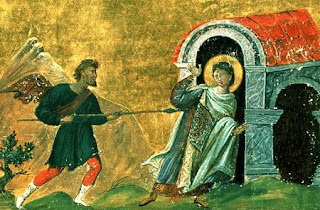 A few days later, on 9th April of the same year some martyrologies celebrate the martyrdom of St. Demetrius, the deacon of bishop Irenaeus. He was killed being pierced in the side with a spear. According to some hagiologists in the Eastern Europe, the real identity of St. Martyr Demetrius of Thessalonica, celebrated on 26 October, was not one of a soldier, but of a deacon. An argument for this identification is that even later in the synaxarion composed by Symeon Metaphrastes in the 10th century attests the fact that a servant of the deacon, named Lupus, recovered his orarion reddened by the blood of the martyr and brought this holy relic to his community (though here it is Thessalonica and not Sirmium). In this context, it can’t be explained why a soldier would have an orarion, which is a typical piece of clothe for a deacon. Moreover, in the first depictions, St. Demetrius is represented as a member of the noble class and not as a soldier. St. Lupus, his servant died also as a martyr, being celebrated on 23 August. It is supposed that the cult of St. Demetrius spread in all Illyricum in the next century (here it would be a problem, not being clear why it did not happen the same with St. Irenaeus), and they are reported many miracles occurred near the coffin with the relics of the saint. In the context of the weakening of the Roman power near Danube in the 5th century, a governor of Illyricum named Leontius have built a church for St. Demetrius in the new capital of the province, Thessalonica, and brought here the relics of the saint, supposedly in 413. So it may that the day of the celebration of the saint on 26 October might be the day of moving his relics. In the same time, Leontius built another church dedicated to the saint in Sirmium, a town named by the Slavs later as Mitrovica (today, Sremska Mitrovica). There are no informations about the relics of the saint. The next period was very difficult for the cities on Danube. After repeated incursions of the barbarians in the V-VI centuries, Sirmium was in decline, the episcopal see ceased to exist. Sirmium decaded later and during the Slavic migration its importance was replaced with Belgrade (the former Singidunum), situated at the confluence of Sava with Danube. ). At this time many other relics many of the Pannonian saints were moved to other areas, where they continued to be worshiped. So happened with St. Demetrius moved to Thessalonica, St. Anastasia to Rome, etc. In any case, the veneration of the saint is recorded in some texts. 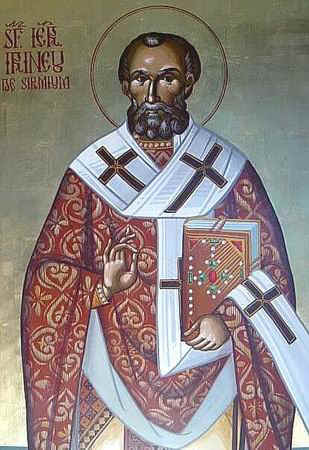 St. Theophylact of Bulgaria, bishop of Ochrid (1088/89-1125) mentioned about a pilgrimage to St. Irenaeus (probably in Sirmium) and so miracles occurred there, in the Vita of the 15 martyrs from Tiveriopolsk. In 1071 or 1072 Sirmium became part of Hungary. 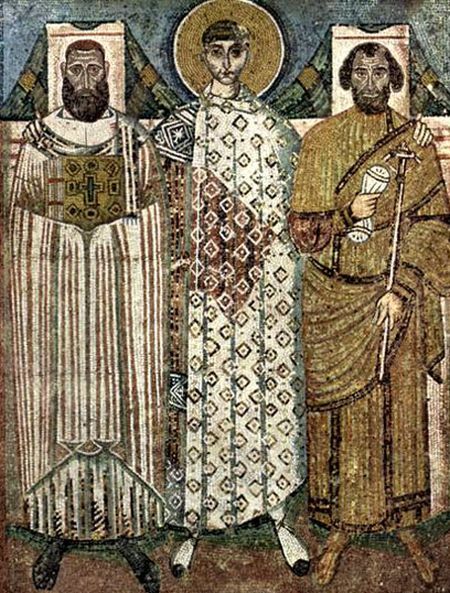 Pope Gregory IX restored in 1231 the bishopric of Sirmium and built a Benedictine monastery dedicated to St. Stephen on the shore of Sava. In the middle of the 13th century there is a mention about a church dedicated to the saint (ecclesia sancti Irenei Syrmiensis), but the exact location of the church is unknown. According to some researchers, it can be identified with the medieval church in Machvanska Mitrovica, on the right bank of the Sava, where it was discovered a cemetery from the 4th century. The church was built on the ruins of a martyrion from the same period and destroyed in 10th/13th century, but there is no data to show that the martyrion was initially dedicated to the saint. 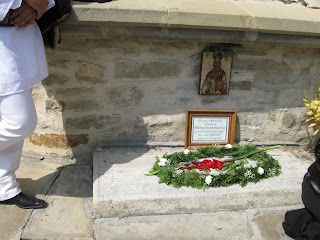 According to a local historian, V. Popovic, the martyrion of the saint may be located in another place, near a bridge which may be identified with the one where the saint was executed (Basent bridge). In 1976-1977 there were made some other archaeological researches in the eastern suburban necropolis of Sirmium. Here there was discovered the ruins of a basilica from the second half of the 4th century. An inscription of an epitaph on the grave there mentioned about the “Basilica of our lord Irenaeus” (in basilica domini nostri Erenei). But this is all. The revival of honoring the martyrs in Sirmium, among who is also Irenaeus, began in his home, Serbia, after Sremska Mitrovica became part of the Habsburg Empire (1718). 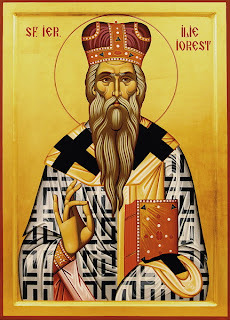 Today St. Irenaeus is honored especially in Serbia, but also in the other eastern European countries, but the dates differ. The martyrical death of Irenaeus is mentioned not only in his martyrical act, but also in another document, namely the Martyrical Acta of St. Pollion, the lector of the Cibalae church (who died on 28 April 304), a few days later. The Martyrology of Hieronymus mentions the martyrdom of Irenaeus on 6 April 304, such as a syriac Breviarium from 411. Another collections state other days: the synaxary of Constantinople: 23 August, together with Irenaeus from Lyons. The second volume of the bollandist collection Bibliotheca Hagiographica Graeca (ed. H. Delehaye, BHG, N 948-949e) remembers St. Irenaeus on 26 March and 23 August, and the first from Bibliotheca Hagiographica Latina (BHL, N 4466; Novum Suppl., N 494-495), on 25 March. The error of dating may be interpreted by changing the 8th day of the Ides with April (6 April) with the 8th day of the Calendae of April (which is on 25 March, but because of the Feast of the Annunciation, his feast was moved a day later). This error was introduced also in some later maryrologies such the one of Florus, the so-called Small Roman Martyrology and Adon from Vienna (all in the 9th century), which may have been copied later in the 10th century by the synaxary of Constantinople. Following these dates, St. Irenaeus is celebrated differently in the Churches. The Roman-Catholic Church celebrates him on 6 April, while the Orthodox on 26 March/8 April and 23 August/5 September, following the synaxary of Constantinople. There is to be mentioned here that the Romanian Church changed in the last years the day of celebration also on 6 April, after the martyrical document. In any case, the Churches following the Julian (old) calendar, even celebrating on 26 don’t make any difference, because 26 March corresponds to the Gregorian 6 April. The Armenian Church celebrates the saint on 23 August.